They come in, guns blazing, not even listening or asking questions to get to the heart of what’s going with their client. And then they wonder why the client says they don’t feel heard, they don’t feel part of the process, and aren’t happy. But it’s mostly over-eagerness and insecurity. You might feel as if you need to have all the answers and have them right away. Let me ask you this. Is it okay to say, “I don’t know” or I’m not sure … what do you think Mr. or Ms. client? If your answer is no, that says a lot. You may very well be closing yourself off from valuable contributions your clients can offer you. And that’s what I want to focus on … client collaboration … what it is, how you put it into practice, and what it can do for you. Here’s the bottom line: You don’t want to just take the ball and run with it. You want to collaborate with the client in an act of “co-creation” to find the best answers. That means you involve the client as much as he or she wants to be involved. You talk through the issues you’re dealing with and ask what the client thinks and how he or she feels about certain approaches … when it’s appropriate … when it makes sense to do so. Clients are generally happiest when they get to define the parameters of the relationship with you and have an appropriate level of input … which is almost always more than they’re currently getting. That’s where long term client satisfaction and loyalty come from. The client feels as if you’re a team, working together, rather than seeing you as a hired gunslinger. The more engaged the client, the stronger the relationship, and this level of engagement should start from the very beginning … with the sales meeting with your prospective client. This isn’t complicated. You listen. You ask good questions. You allow the client to frame the issue in as much detail they care to give you. You don’t treat the client as an expert, but you do want to get inside their heads. You do want to see where their emotional trigger points are. You do want to deftly probe to see if they have some ideas you hadn’t thought of! Now, there is one caveat. Some people want you to just take the ball and run with it. They don’t want to be involved. They don’t want to be bothered. It’s like going to the doctor. Some people want to have the doc just write a prescription and tell them what to do. Other people want to be a lot more actively involved in their own care. It’s not hard to figure out which kind of person you’re dealing with … a hands-off or a hands-on person. And guess what? You can always ask what level of engagement they prefer. But here’s what I want to leave you with. 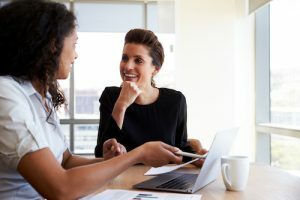 If you’re not giving the client the opportunity to be more involved, you could very well be throwing away the chance to not only connect more deeply, but to get some ideas and insights you never would have gotten had you gone it alone. So, think of your ideal relationship with your clients as co-creative … collaborative. It’ll serve you well.